Can you make stone come to life? You could say that Han Sai Por can. Her sculptures have been described as organic and inspired by nature. Through her gift, she helps stone take on figurative qualities that make them almost come alive. 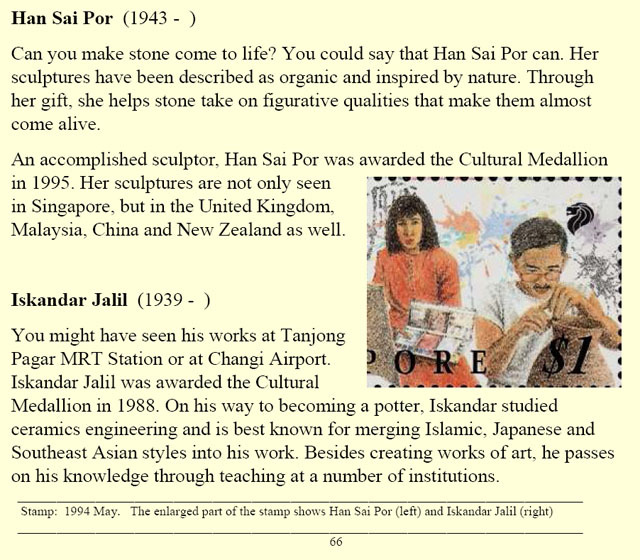 An accomplished sculptor, Han Sai Por was awarded the Cultural Medallion in 1995. Her sculptures are not only seen in Singapore, but in the United Kingdom, Malaysia, China and New Zealand as well. You might have seen his works at Tanjong Pagar MRT Station or at Changi Airport. Iskandar Jalil was awarded the Cultural Medallion in 1988. On his way to becoming a potter, Iskandar studied ceramics engineering and is best known for merging Islamic, Japanese and Southeast Asian styles into his work. Besides creating works of art, he passes on his knowledge through teaching at a number of institutions.